The Byron Bay Ocean Swim Classic ‘Big Swim’ is an ocean swim from Wategos Beach to Main Beach and is approximately 2.2km from Wategos Beach to Main Beach, Byron Bay. Held annually on the first Sunday in May, to raise money for selected charities and local organisations. Attracting a broad range of swimmers from throughout Australia. Interstate swimming clubs frequently use the Byron Bay Ocean Swim Classic as an end of season opportunity to visit the iconic town. 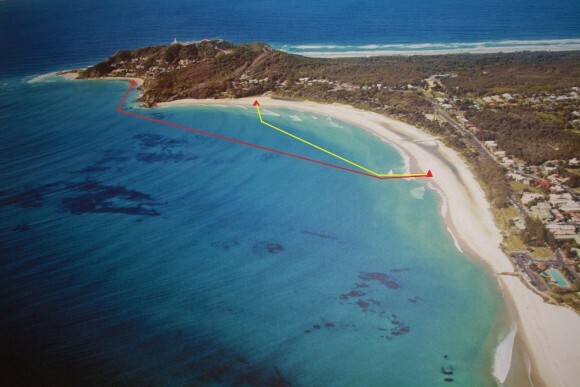 The Byron Bay Ocean Swim Classic (red) is approximately 2.2km from Wategos Beach to Main Beach, Byron Bay. The Classic is a buoyed course from the start area, around The Pass and across the Bay to Main Beach. The Ky Hurst Mini Swim (yellow), is run prior to the main swim. This shorter distance swim starts from Clarkes Beach along Main Beach and is designed as an introductory swim for novice ocean swimmers and also for children who are good swimmers down to age 9 years. Byron Bay Accommodation books out fast on the Big Swim weekend, so book early to avoid dissapointment. Byron Bay Holidayz have a selection of Byron Bay holiday houses, apartments, motels and hotels. You can BOOK ONLINE or call our local Byron Bay office on 02 6685 6985.